1 p.m : South Korea has blocked civilians from visiting a tourist observatory and other locations near the border with North Korea in response to tensions following the North's purported nuclear test. An official from the South's Paju City said Saturday that Dora Observatory, which looks across the Demilitarized Zone, and a museum made from an old North Korean infiltration tunnel have been shut down since Friday, when the South restarted propaganda broadcasts through loudspeakers near the border. South Korean officials say there have been no disruptions so far at an industrial park jointly operated by the rivals in the North Korean border town of Kaesong. Officials say 512 South Koreans stayed at the park overnight, and 479 of them were scheduled to return to the South later on Saturday. 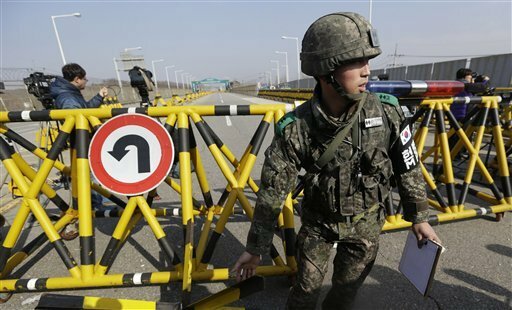 Another group of 269 South Koreans have been permitted to enter Kaesong on Saturday. There are fewer South Koreans at the park than usual, because South Korea began limiting entry to the area after the North announced a nuclear test on Wednesday.